After decades of uncertainty, it now seems clear that global warming will enhance both the amplitude and the frequency of climate phenomena known as eastern Pacific El Niño events, with widespread climatic consequences. Yoo-Geun Ham is in the Department of Oceanography, Chonnam National University, Gwangju, South Korea. During El Niño events, sea surface temperatures (SSTs) in the Pacific Ocean increase. These rising temperatures cause considerable reorganization of atmospheric circulation, resulting in extreme weather events worldwide and strongly affecting ecosystems, human health and the global economy. The reorganization is greater for El Niño events that generate maximum warming in the eastern equatorial Pacific than for those producing maximum warming in the central equatorial Pacific — referred to as EP- and CP-El Niño events, respectively. Despite the huge impact of these phenomena, there has been no consensus on how the SST variability associated with El Niño events will change with global warming1,2. But on page 201, Cai et al.3 report robust agreement among climate models that both EP-El Niño SST variability and the frequency of strong EP-El Niño events will increase. Conventionally, the response of El Niño SST variability to global warming has been investigated in climate models using SSTs at a fixed location. In the case of EP-El Niño events, this location is typically in the eastern equatorial Pacific (the ‘Niño3’ region: 5° S–5° N, 150°–90° W). Such an approach assumes that all models simulate an EP-El Niño centre — corresponding to the location of peak SST variability — that is the same as the observed centre. Cai and colleagues’ breakthrough comes from the realization that this fundamental assumption is invalid. The authors find that the longitude of the simulated centres differs greatly between models, and they examine the response of EP-El Niño SST variability to global warming at the centre of each model. Another common limitation of climate models is their inability to simulate distinctive CP- and EP-El Niño events4. Cai et al. show that this limitation reflects a deficiency in simulating asymmetries between CP- and EP-El Niño events, and between these phenomena and their counterpart La Niña events, which are associated with cold SST anomalies (departures from average conditions). The cold SST anomalies of La Niña events, particularly extreme episodes, tend to occur in the central Pacific. Consequently, in the central Pacific, these anomalies are typically larger than the warm SST anomalies associated with CP-El Niño events — the anomalies are negatively skewed (Fig. 1a). By contrast, in the eastern Pacific, SST anomalies are positively skewed (Fig. 1b). The location of maximum negative SST skewness is the CP-El Niño centre, whereas the location of maximum positive SST skewness is the EP-El Niño centre. As a result, models that more accurately simulate these skewed features produce more-distinctive CP- and EP-El Niño centres. A technique called empirical orthogonal function (EOF) analysis is often used to study spatial patterns of climate variability and how the amplitude of such patterns changes with time. Data are projected onto these spatial patterns to obtain variables known as principal components, which describe the amplitude of the patterns at each time step. To distinguish between CP- and EP-El Niño centres, at least two principal components representing two distinctive patterns are required5. Cai and colleagues obtain these variables from an EOF analysis of SST anomalies in the tropical Pacific, which yields two dominant principal-component time series and two associated anomaly patterns5. They then use a linear combination of these principle components and patterns to identify an individual EP-El Niño centre for each climate model. Finally, they introduce an EP-El Niño index for each model, which represents the model’s EP-El Niño centre and pattern. The authors report that a reasonable consensus emerges: 24 of the 34 available models (71%) predict an increase in EP-El Niño SST variability under a climate-change scenario (known as RCP8.5) that assumes greenhouse-gas emissions will continue to rise steeply throughout the twenty-first century. However, most of the models underestimate the SST skewness. Cai et al. show that nonlinear processes responsible for the negative skewness in the central Pacific are tightly connected to those for the positive skewness in the eastern Pacific, and are represented by a nonlinear relationship between the two principle components. Focusing on 17 models that simulate these nonlinear processes realistically, the authors find an even stronger consensus: 15 of the 17 models (88%) predict a rise in EP-El Niño SST variability under the RCP8.5 emissions scenario. 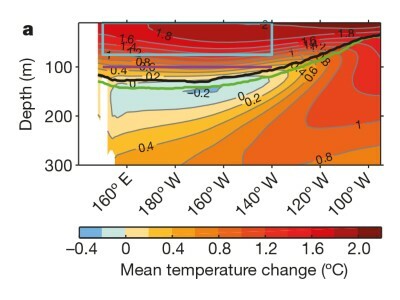 Cai and colleagues’ work shows that, under global-warming conditions, warming occurs more quickly at the surface layer of the ocean than in subsurface layers6. This increases the vertical temperature gradient of the ocean, which in turn enhances the dynamical coupling between the atmosphere and the ocean. Consequently, the equatorial ocean–atmosphere system becomes more efficient at converting stochastic fluctuations in winds into a potential EP-El Niño event, leading to increased EP-El Niño variability. The authors’ results also indicate that, by a similar mechanism, SST variability in the central Pacific is enhanced (albeit not as strongly as in the eastern Pacific). This translates into an increased frequency of CP-El Niño events and of extreme La Niña events — a conclusion that is consistent with previous studies7,8. 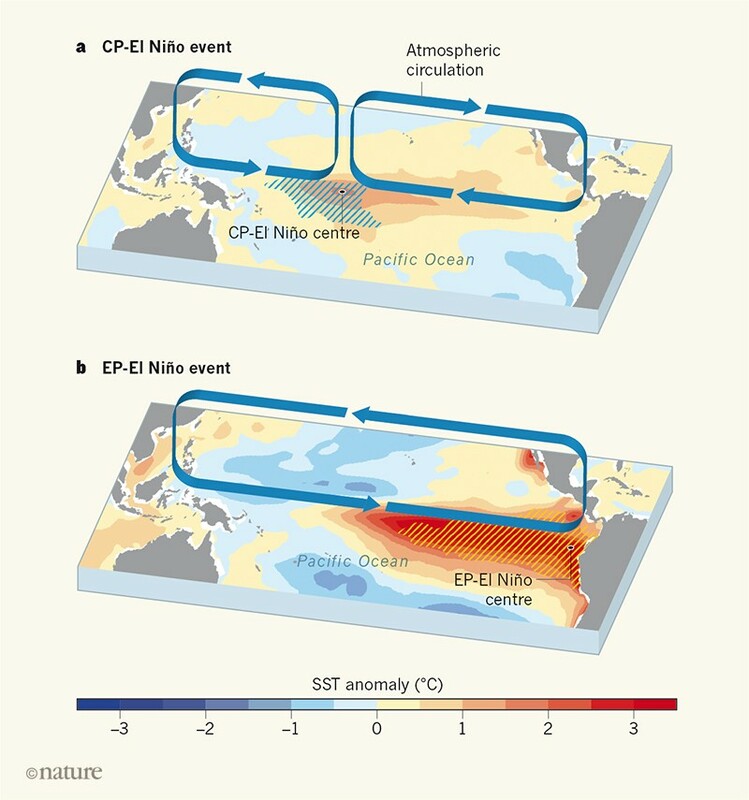 The authors’ finding of increased EP-El Niño variability under global warming represents a milestone in climate research, and will inspire studies of the worldwide impact of future changes in El Niño events. However, the work also raises many questions. For example, why do so many climate models fail to simulate the nonlinear processes associated with the SST skewness? What leads to the large discrepancies in the model simulations? And how sensitive is the reported consensus to future models? Cai and colleagues’ results therefore need to be assessed further as other model simulations become available. Nevertheless, the projection of more-frequent and stronger El Niño events must be taken seriously, as we prepare to deal with the consequences of global warming. Collins, M. et al. Nature Geosci. 3, 391–397 (2010). Cai, W. et al. Nature Clim. Change 5, 849–859 (2015). Cai, W. et al. Nature 564, 201–206 (2018). Ham, Y.-G. & Kug, J.-S. Clim. Dyn. 39, 383–398 (2012). Takahashi, K., Montecinos, A., Goubanova, K. & Dewitte, B. Geophys. Res. Lett. 38, L10704 (2011). An, S.-I., Kug, J.-S., Ham, Y.-G. & Kang, I.-S. J. Clim. 21, 3–21 (2008). Cai, W. et al. Nature Clim. Change 5, 132–137 (2015). Yeh, S.-W. et al. Nature 461, 511–514 (2009). Rayner, N. A. et al. J. Geophys. Res. 108, 4407 (2003).